Plain washer progressive Die Stamping is a demanding method of working with metal that can encompass not just “stamping”, but punching, bending and several other ways of modifying various types and grades of metal raw material, combined with an automatic feeding system. Progressive stamping dies are made of tool steel to withstand the high shock loading involved, retain the necessary sharp cutting edge, and resist any abrasion forces involved. The progressive stamping die is placed into a reciprocating stamping press. As the press moves up, the top die moves with it, which allows the material to feed. When the press moves down, the die closes and performs the progressive stamping die operation. With each stroke of the press, a completed part is removed from the die. A feeding system pushes a strip of metal as it unrolls from a coil through all of the stations of a progressive stamping die. Each station performs one or more operations until a finished part is made. Additional work is done in each “station” of the progressive stamping die. The strip must be advanced very precisely so that it aligns within a few thousandths of an inch as it moves from station to station. Bullet shaped or conical “pilots” enter previously pierced round holes in the strip to assure this alignment since the feeding mechanism usually cannot provide the necessary precision in feed length. The final station of the progressive stamping die is a cutoff operation, which separates the finished part from the carrying web. The carrying web, along with material that is punched away are knocked down or out of the dies, and then ejected from the die set. Scrap material is transferred to bins to be recycled. The number of features determines what tooling and how many stations the progressive stamping die will have. Many companies advise keeping the number of features as simple as possible to keep the cost of the progressive stamping die tooling to a minimum. They may want extra clearance for the punch, which could result in another station. It can also be problematic to have narrow cuts and protrusions. This is not a practical approach as the part needed may have features that need to be close together. The progressive stamping die design should not be a reflection of the limitations of the designer or the shop. Such “problematic” situations require the most exacting design of the progressive stamping die itself. Bahrs expert tool and die makers see these potential problems, but can also ‘see and think’ about how to resolve them through masterful progressive stamping die design to produce parts that meet the need. As a first critical aspect of tool design, the progressive stamping tool and die designers at Bahrs Die & Stamping gain a clear understanding of the part and intended end use application. Only time, training and experience in the design of tooling and progressive stamping dies can supply this critical ‘forward thinking’ necessary for a progressive stamping die to be designed that is exact and meets the need. 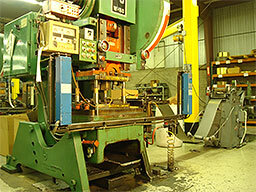 Bahrs Die & Stamping has been producing quality custom progressive stamping dies and metal stampings for 75 years. It is our goal to supply the finest quality progressive stamping dies and tooling at very competitive prices without sacrificing critical aspects of progressive stamping die and tool design and function. We design, build and maintain our own progressive stamping dies, tooling and fixtures in house giving us control over all aspects of the manufacturing process. The owners of Bahrs Die & Stamping are designers and engineers with over 60 years of experience custom designing Progressive Stamping Dies for a wide variety of applications.